87 out of 100. Incorporating 300+ ratings and reviews. Founded in 1985, Focusrite is a relatively new company that has gone to the top of the heap with their quality preamps and consoles. They are very popular in the portable audio interface market, thanks to their Scarlett series. Earlier this year, the company updated the Scarlett series, including the 6i6. Unfortunately, the 2nd generation model was not as warmly received as its predecessor, which is why the 1st Generation Scarlett 6i6 is the one that made it to this list. 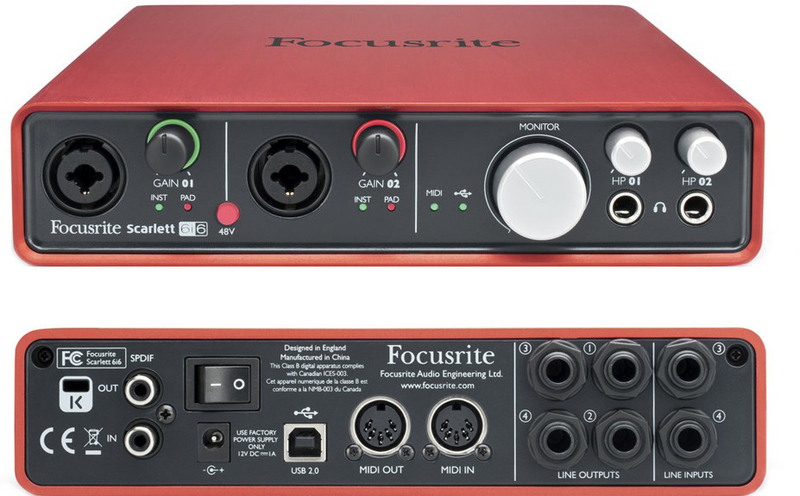 While its analog to digital resolution maybe a bit lower at 24bit/96kHz, its main selling point is still the two Focusrite mic preamps, all of which are housed in their popular red metal unibody design. It's impressive how reviews of the 1st Gen Scarlett 6i6 are consistently positive years after it was first released. And up to today, people are still praising it for its pristine sound quality and the details that it captures. The unit's trademark red finish unibody design was also mentioned numerous times, along with its reliable performance. Interestingly, a number of users found other uses for the 6i6, to be specific, as a standalone headphone amplifier for monitoring in live performance situations. While most users and experts are all praised on the hardware itself, some are not too happy with the accompanying software, MixControl. And since you need it to install the drivers needed, some consider it as a one time annoyance, albeit a minor one. Another important downside is the availability of the 2nd generation model, which while currently hit with driver issues, is still considered as an improvement to this version by the manufacturer. The Focusrite Scarlett 6i6 is popular for good reason, be it the 1st or 2nd generation model, it should be at the top of your list if you're in the market for a 6-channel audio interface.